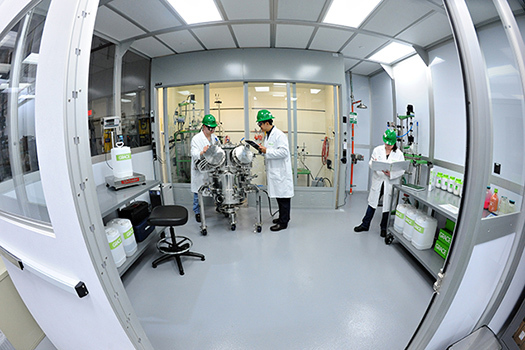 Grace Expands Fine Chemicals Development, Production Capabilities with New cGMP Kilo Suite at Oregon Facility | W. R. Grace & Co.
ALBANY, OR. – May 22, 2017 – W. R. Grace & Co. announces expansion of its current Good Manufacturing Practice (cGMP) development and production capabilities with the opening of a cGMP-compliant Kilo Suite at its Albany, Oregon facility. The new kilo lab can produce advanced intermediates of high quality, consistency, and control. The lab includes a wide range of all-glass reactor systems from 15 to 100 liters, an Aurora® filter dryer, a walk-in hood, and an integrated air-lock system. The state-of-the-art R&D scale-up facility is cGMP compliant and equipped to produce multi-kilogram quantities. Brett Reynolds, Grace's Global Business Director, Fine Chemicals, said, "This expansion represents the latest evolution of the Albany facility to expand our cGMP offering to meet the standards of our emerging and large pharmaceutical customers. We continue to expand our capacity and capabilities to provide custom manufacturing for preclinical, clinical, and commercial production of regulatory starting materials and intermediates." The Albany site's operations team has more than 30 years of custom manufacturing experience in multi-step organic, organometallic, and chiral chemistry, and integrated grams-to-kilos-to-tons production. Built on talent, technology, and trust, Grace is a leading global supplier of catalysts and engineered materials. The company's two industry-leading business segments—Catalysts Technologies and Materials Technologies—provide innovative products, technologies, and services that enhance the products and processes of our customer partners around the world. With approximately 3,700 employees, Grace operates and/or sells to customers in over 60 countries. More information about Grace is available at grace.com.